In the 60’s, W. Harold Monken was a partner with David Woolbright at the Standard Gas Station in Centralia. Harold was always the hot rodder spending much time improving his vehicles and racing them at night and weekends. His brother, Wayne Monken, and father, Walter Monken, helped build a small garage/dealership that opened as Car City on November 4th, 1967 on Shattuc Road west of Centralia. In 1971, a Japanese gentleman from Datsun was canvassing the area to find a dealer partner to represent what is today known as Nissan. Harold was interested and the business later became Car City Nissan. The 70’s were a great time to own a dealership that offered inexpensive vehicles with great gas mileage. They sold the shiny Datsun vehicles as fast as they could get them. In the 80’s, Harold recognized a dealership trend to become bigger in order to survive. He explored adding Chrysler when Booth Motors closed. In 1987, he flew to Chicago with his attorney, Bill Crain, to close the deal with Chrysler, but had a last minute change of heart. He ultimately sold Car City Nissan to his General Manager Mike Gansauer and Mike’s father in law, Bob Cleary. In 1988, Mike & Bob purchased Meier Chevrolet and moved from Shattuc road. The business was now Car City Chevrolet Nissan. Several prominent business partners, including the Geary Family and the Cooksey Family were investors. In the early 90’s, Harold opened Car Country for a few years, and then worked for Jansen Chevrolet in Germantown. In 1996, Bruce Geary told Harold that they were ready to exit the auto business. Harold returned to Car City and asked Mike Jansen to be a business partner with him in order to purchase the dealership. However, GM already had three dealerships in Centralia. They were Dobbs/Mahan Buick GMC, Car City Chevrolet and Seeburger Oldsmobile Cadillac. GM was strategically cutting dealers with a plan called Project 2000. GM only wanted two dealers in the Centralia market and wouldn’t approve the sale of Chevrolet. It took months to negotiate. Ultimately Chevrolet was sold to Seeburger, and Car City became Monken/Jansen Chrysler Plymouth Dodge Nissan on May 1,1997. Harold’s son, Wes Monken, joined a month later in June 1997 relocating from the Chicago area. Harold and Wes purchased out Mike Jansen in 1998 and dropped the name Jansen to become Monken Dodge Chrysler Plymouth Nissan. Later that year, Monken’s purchased the Jeep franchise from Dobbs/Mahan in Centralia. In 2005, discussions began about the Monken’s acquiring Dobbs/Mahan Buick GMC. The plan was to have Harold’s daughter, Kim Monken McMillan, run the dealership. In February of 2005, Harold was rushed to the emergency room. Our long term attorney, Marvin Miller, met us at the hospital to sign a Power of Attorney over to the family. This is how Kim learned that she was coming to work for the family! The purchase of Dobbs/Mahan Buick GMC was finalized in June of 2005. Harold had a significant leak on his mitral valve caused by an infection. He battled through three valve transplants, a stroke and ultimately passed away on July 22, 2006. With great patience and hard work, Wes and Kim found a way to make both stores thrive. In late 2013, Lance Marcum son-in-law to Kim, joins the team. Monken Buick GMC purchases Schmidt Chevrolet in May of 2014 and relocates Buick GMC to the their building across from Walmart to become Monken Chevrolet Buick GMC. In June of 2018, Monken’s purchased Tyler Toyota Buick GMC in Mt. Vernon. It is now Monken Toyota Buick GMC. The dealership has been adding employees and expecting a high level of customer service. The sales associates are non-commissioned and further solidify our move to transparent market based pricing. Our inventory is growing daily in the Toyota and GM showrooms. 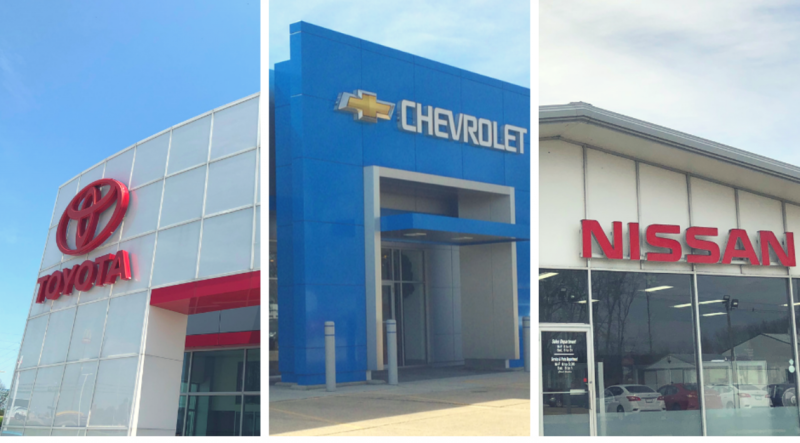 Monken Automotive now has 9 brands in 3 locations with Buick GMC in both the Centralia and Mt. Vernon stores. Great article Wes!! Thank you. Enjoyed reading the story and “filling in the blanks” on the history as we knew it. As you know, Wayne’s first purchase was a brand new blue 1978 “Datsun” pickup from Car City. If you run across any other old photos it would be great to see them! Your Dad was the best! I am sure he and your Mom are very proud that his “kids” are carrying on his tradition of taking care of his customers and making them feel like family! Thanks LuAnn! Your family has been incredibly good to the Monken dealership family! Thanks LuAnn! As such a long time customer you were there this history and probably can fill in blanks that I have missed! What a great history about a wonderful family! Your dad would be proud of what your families have done and continue to do for the Centralia and surrounding communities. Thanks so much! We had great teachers in Mom and Dad. Dad had a hand written note on his wall “Happy Customers Come Back.” It is a very simple yet can be hard to execute but we certainly work hard at it. Harold is a legend! I don’t think I’ve met a person from this area that doesn’t have a good story about him. We all have some, most have to be told in person. Lol. Everyone loved him. He has to be smiling down from heaven looking at his family. He has to proud. He left a lasting impression on people and kept everyone smiling and on their toes. I know my family wouldn’t be the same without him and Jan in our lives. I was blessed to know him from the time I was born. Thanks for the great comments and ours wouldn’t be the same without your family! I am also glad that you have forgiven or forgot me coming over and picking on you or Craig. Being the youngest at my house, I was on the receiving end by girls no less!